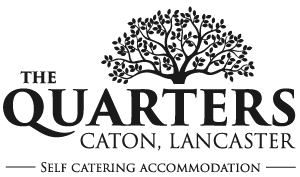 The Quarters Lancaster | Accessible self-catering accommodation. On the edge of the Forest of Bowland, a tranquil moorland gem, with the unspoiled River Lune, The Quarters is your perfect home away from home. We’re situated in Caton, a thriving North Lancashire village, just 2 miles from the M6 motorway, and only a short distance away from the historic City of Lancaster. Caton has a number of convenient shops and pubs, and its setting in the picturesque Lune valley makes it an ideal home-base for walking, cycling and a wealth of other activities. Our fully accessible, pet friendly, apartment is available to book all year round. So please, take a look at our website and get in contact if you have any questions or would like to make a booking.